The 1948 Papal Commission was primed by key members of the Liturgical Movement to reform the Easter Vigil in response to demands by the German Bishops, among whom the last vestiges of liturgical order, discipline and loyalty to Rome had broken down. As we have seen, they had set up an autonomous Episcopal Conference for liturgical matters in 1940 independently of Rome, the aim of which was to wrest control of the liturgy from the Holy See. While promoting the dissident activities of avant-garde liturgists in their own dioceses, the German Bishops were strongly supported by their compatriot and front man in the Vatican, Fr. Augustin Bea, who was a permanent member of the Papal Commission. This was, of course, a complete fabrication. There was not the slightest evidence of a world-wide consensus of priests supposedly massing on the horizon and calling for revolutionary changes in the liturgy. But, liturgical revolution was precisely what the Commission had the potential to bring about. It could and did put pressure on Pius XII to abolish or alter liturgical legislation or pass innovatory laws at a stroke of a pen. As we work our way through the 1951-1956 Easter Vigil reform, we should note that the principle of fidelity to Tradition was starting to be replaced by the principle of destruction and innovation. The way was, thus, opened for progressivist, tendentious and prejudiced views fresh from the Committee Room to become the official policy of the Holy See and be set in juridical stone. But, the incredible did happen, first in 1951 with the experimental Easter Vigil, then with the publication of Pius XII’s new Ordo of 1956 containing the full-blown reforms. 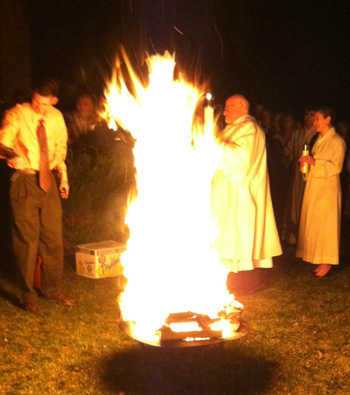 The reformed Easter Vigil begins, as in the ancient rite, with the lighting of the Paschal fire; so far, so traditional. But, any concordance between the two ceremonies ends there. What happens next is the stuff of all revolutions. The reformed rite immediately starts, in true Procrustean fashion, on its path of racking, hammering and amputation of living, viable elements of tradition to make them fit new ways of thinking. It is now well established that when the Novus Ordo was created, prayers were removed, which had expressed the Church’s teaching on concupiscence (the “fiery darts”) and the necessary spiritual warfare a Catholic must engage in against the assaults of the Devil. But, the basic and indisputable fact, unknown to most, is that Fr. 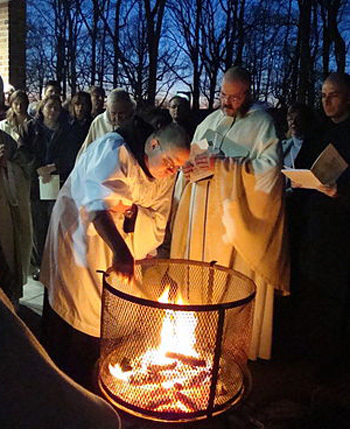 Bugnini started this process with the 1956 reform of the Easter Vigil by expunging this prayer from the blessing of the new fire. With it he also expunged a vital element of Catholic doctrine expressed in the liturgy: that the items blessed by the Church’s prayers are imbued with the power of God to protect the faithful from the influence of the Devil. This is only one example among many to illustrate how the ancient traditions possess valuable points of wisdom whose loss impoverishes the spiritual life of Catholics. If the aim of the reform was to “make the liturgy become the source of an authentically Christian life,” as its leaders have constantly proclaimed, this cannot be achieved by destroying traditions and squandering inherited resources. For, it is axiomatic that the lex orandi shapes the lex credendi, which in turn influences how we live. When these prayers were removed from the liturgy, the faithful were deprived of the spiritual aid that the Church had lavished on them for centuries. Also missing from the 1956 prayer of blessing the fire is the former reference to God the Father, the Son and the Holy Ghost, an omission whose significance will become clearer later in the rite. A parallel can be drawn with the excision of all but one of the prayers for the blessing of palms in the 1956 Palm Sunday reform. The question arises as to why the progressivist reformers dismantled the elaborate structure of blessings, whether in the Palm Sunday or the Easter Vigil ceremonies, that the Church had built up to emphasize the very essence of Holy Week as a celebration of Christ’s work of redemption from which all blessings draw their source. The full significance of these truncated blessings only emerged after Vatican II. They were the prelude to the phasing out of the blessing of objects (3) in the post-Conciliar period when, generally speaking, priests no longer believed that they possessed, through the Sacrament of Ordination, the power to bless material things or that there is any difference between the sacred and the profane. All the evidence indicates that, from the outset, this was the outcome desired by the members of the Papal Commission. That is exactly what the “Memo” had set out to achieve in 1948. And the 1956 reform was only one stop along the road to the terminus ad quem [the final goal]. 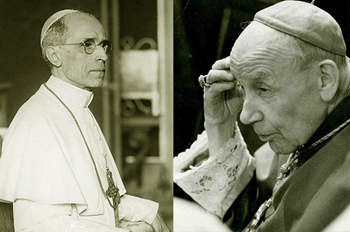 On November 2, 1950, the Bishops of Germany and Austria, in conjunction with France, formally petitioned Pope Pius XII to move the celebration of Holy Saturday to the night time. This request had been proposed by Romano Guardini at the First German National Liturgical Congress, organized by the Liturgical Institute of Trier in Frankfurt in June 1950. Guardini could hardly be described as a “courageous” reformer. In a 1940 letter to Bishop Stohr of Mainz, published as Ein Wort zur liturgischen Frage (A Word on the Liturgical Question), he petulantly demanded that the German Bishops should protect the members of the Liturgical Movement from attacks against their convictions and work. But as long as he was hiding behind the skirts of the German Bishops, his agenda can be seen as both craven and partisan. So great was Guardini’s popularity in the liturgical Establishment that even Pius XII protected him and made him a Prelate of the Papal Household in 1952. The Cardinal Archbishop and Bishops of the Province of Westminster, A Vindication of the Bull Apostolicae curae, London, 1898, p. 42. The new Book of Blessings that replaced the Rituale Romanum has largely dispensed with blessing items for use by the faithful. The designated prayers mention blessing the people when they use the item, blessing those who made it or look at it, but not the actual item itself.